Qwiki is such a promising concept in making search results more 'user friendly' that it will be quickly forgiven for sending out its "Qwiki of the Day - Dec. 28" around a dozen times to each member. Its blog reckons that only a small number of people were affected, so presumably they jumped on the issue pretty quickly. I still received two emails for the December 30th Qwiki of the Day, but I guess that this is the last of these issues. Apologise soon Don't just ignore the bad thing you've just done, even if it only affects a few people. Fess up and explain how it's being improved. Be watchful for configuration changes and gremlins Just because something worked fine hundreds or thousands of times in the past, something (maybe out of your control) may have changed or a time-bomb of some description may be lurking. 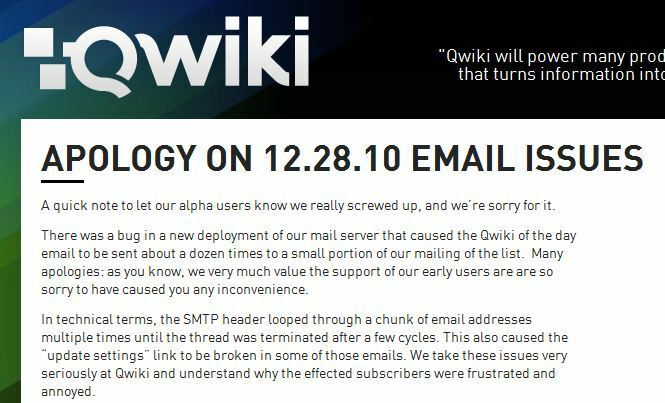 Read Qwiki's full explanation at: Apology on 12.28.10 Email Issues.